This' gonna be fucken funnn! Yo Venus did you do the flyer?? Looks good. A whoa and Appleton drink specials!! !Pity I'm not drinking at the mo! 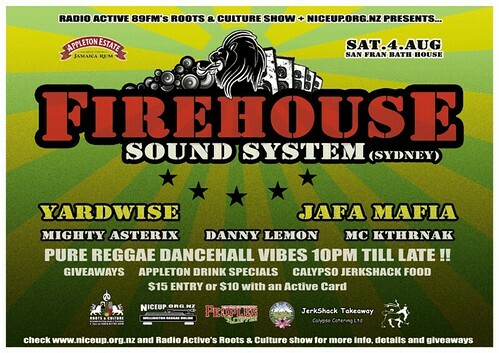 Saturday 4 August @ The San Francisco Bathhouse, Wellington, NZ. Why is this gig at a gay club? Have fun inna me hometown guys! I wish I could be there to show you's around. Yardwise are a wicked bunch though and they'll sort you out. Ok after much delay, I'm finally able to report back and say how wicked it was to have Firehouse inna Welly! We were all really pleased with how the night went, and for the Welly & NZ massive it was a really special occasion - three sound link-up - and especially momentous for us to have a sound from Oz in town. DJ Danny Lemon built up the vibes early on, then Yardwise kicked things off, followed by Firehouse and Jafa Mafia doing their thing, each crew taking turns playing around 45 minute sets till Yardwise and Lemon wrapped things up - with JP Money hosting the night and Asterix blessing the mic. It was great to have the diversity in selections and styles in the dance - is an experience for us and great to see reggae forwarded in different ways. I'll try get audio up at some point soon. Of course, large-ups going out to NZ crews Yardwise and Jafa Mafia - you guys rock! But I just gotta say big respect to L.Static & Nardo - thank you for coming and show-casing a small piece of your immense skills for us at the gig and on the radio show. You guys are wicked and we loved having you here and we hope you come back soon! It also sounded liked the Dubwize gig was a big success - lots of people and nice vibes. just lettin you all know the audio from the welly night is now up....we're gonna be improving the look of the audio section soon but at the moment each set has it's own link. Thanks for the link Venus ... downloading some parts now ! checking the first Firehouse set now... loving the Beres "Step Aside" dubplate!